The quest for the simple life is one that has been undertaken by many throughout America’s history. However, in the age of consumption and global warming, we can see that the traditional ways that people have created the good life for themselves can have dire consequences across the globe. In The Unsettlers, author Mark Sundeen wades through the complicated issues of sustainability, and examines many ways we could create a simpler life. When Sundeen, author of The Man Who Quit Money and The Making of Toro, was married, he and his wife had questions about what it meant to live the good life in America’s consumer culture, and how to do it sustainably. They quickly found that this is much harder than it seems. Energy is often created by burning fossil fuels, food is transported over long distances to fill shelves in grocery stores across the nation and waste is rampant. To learn what he could, he traveled across America, questioning those who were attempting the same thing that he was. He found a new family homesteading in La Plata, Missouri, a horticulturist growing food in Detroit’s urban sprawl and a couple who has been at the forefront of the farm-to-table movement in Montana, and pioneering what it means to raise a family ethically. Through his journey, Sundeen examines how we’ve gotten to the point that we have, what we have gained and what we have lost in the process. What he finds is the transition to sustainability will consist of hard work and many deliberate choices about how to achieve our goals. Sometimes, these choices even seem revolutionary, as they are so against mainstream American culture, and the common experience of the citizenry. The Unsettlers is an interesting and inspiring book. Sundeen examines the role he plays in the world and the ways that he could exist more sustainably. The issues surrounding sustainability are often complicated, and some of the views are often counter-cultural. He sometimes experiences setbacks, but he finds inspiration through the people he found on the same quest. “They challenged me not to quit my own dreaming just because my vision could never be made perfect,” Sundeen says. 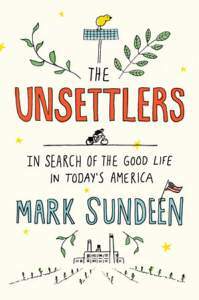 What: Mark Sundeen will discuss his new book, The Unsettlers. More information: The Unsettlers will be available there for purchase.